If you’ve never tried making a sorbet, they are REALLY easy, and so tasty! You might want to check out my recipe for Watermelon Sorbet as well! 4 cups of cubed, peeled cantaloupe (make sure to remove all of the seeds!!) – I made a batch of this today, and didn’t measure. I just used one whole cantaloupe. Peel and cube your cantaloupes. Try to resist eating all of your cubes as you prepare the melon! When the simple syrup is ready, and has cooled, combine it with the cubed cantaloupe and fruit juice in a blender. Puree until the mixture is nice and smooth. Pour the melon mix into your ice cream maker and follow the user directions. If you do not have an ice cream maker, you can simply pour the mixture into a freezer safe container, and allow to freeze and harden for about 4 hours. It will have more of the texture of a granita, rather than a sorbet, but will still be delicious! 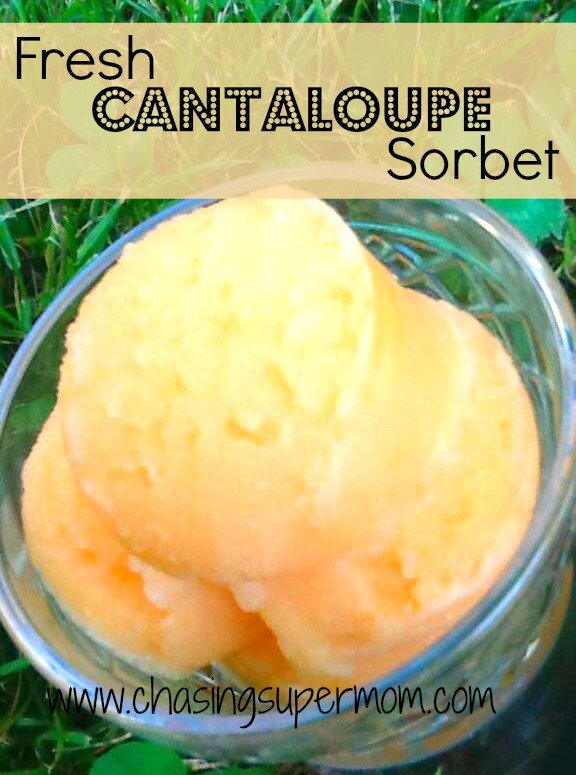 Cantaloupe Sorbet sounds so refreshing and delicious – what a lovely fruit to use for sorbet. Thank you for sharing your recipe with us at Hearth and Soul.